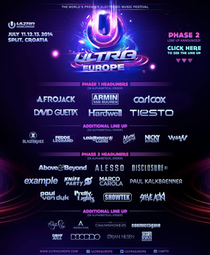 With the recent Phase 2 additions to the Ultra Europe 2014 line up getting dance fans excited for the second edition of the festival in Split, Croatia this July, UMF TV recently released a new video to increase the hype for the forthcoming festival. The video features highlights from the 2013 event along with the new artist billing and nice shots of the Dalmatian Coast, to give revelers an idea of what they can expect on the weekend of July 11th – 13th when Ultra Europe returns to the Poljud stadium. This year aims to be bigger and better, with big headliners such as Tiësto, Armin van Buuren and David Guetta leading the charge, ably supported by a line-up of big name DJs from across the globe, including Laidback Luke and Aly & Fila. Check the video below. Very nice post. I just stumbled upon your weblog and wanted to say that I have truly enjoyed surfing around your blog posts. In any case I'll be subscribing to your rss feed and I hope you write again soon!